Two weeks worth of books this time, since I didn’t get around to doing an entry last week before heading to Disneyland for the weekend. I skipped JSA: All-Stars, not just because I didn’t really care about following “Power Girl and the third-stringers”, but because the artwork looked pretty awful. I’ll stick with the team which at least has a few of the classic members, thanks. I started picking up The Secret History back before I knew it was a translation of a European comic that Archaia was printing. It got off to a pretty good start, though (albeit way back in 2007). 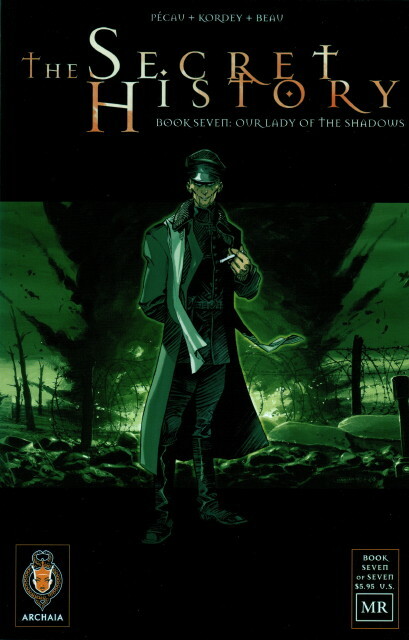 As the title says, the story is a shadow history in which four individuals gain immortality and great powers through runestones they acquire early in humanity’s history, and they use it to influence events over the centuries, eventually warring against each other, forming and breaking alliances, and often using catspaws to do their work. The early issues held together pretty well, but as the series progressed the overall story became very hard to follow, and even single issues were pretty confusing in terms of figuring out who’s who and what they’re up to and why. Greg Burgas has the series sized up well, as at the end of this 7-issue series the story isn’t over. It ends abruptly, actually on something of a cliffhanger, at the end of World War I. That left me wondering why I’d bothered; there wasn’t a big finish, and I just felt like I didn’t care about any of the characters by the end – I could barely tell who they were! The art is often quite good, but it’s not enough to make up for the story. I can’t fault author Pécau for the ambitious plot, but the execution just didn’t work for me. Even if there is a follow-up series (and I haven’t heard of one), I’m not interested enough to follow it. I decided to pick up this month’s Doom Patrol and R.E.B.E.L.S. 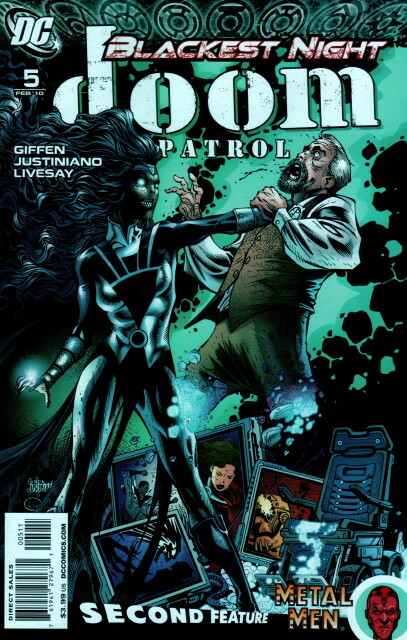 to see how the Blackest Night tie-in stories begun last week shake out. The answer is: Not so well, as both are essentially big slugfests against overwhelming odds, with the heroes more-or-less cheating their way to victory. Heck, they even find the exact same resolution to their dilemma in each case! Disappointing. 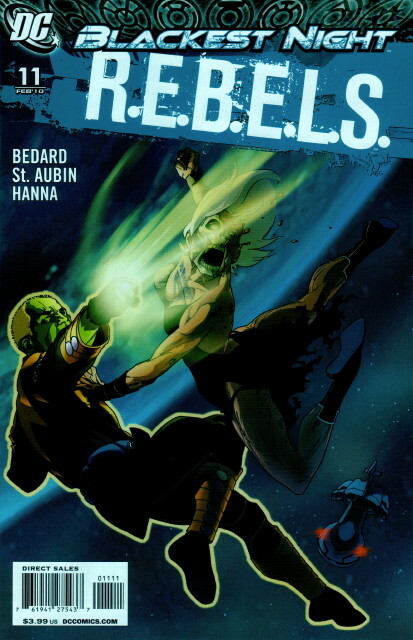 The most interesting element of either series – Vril Dox acquiring a Sinestro Corps ring – is discarded at the end of the R.E.B.E.L.S. issue, too. Oh well. Considering Blackest Night presented some of these series with excellent opportunities to convince new readers like me that they were worth following, it’s pretty lame that they all did such a bad job in doing so, focusing instead on the Blackest Night story arc rather than trying to sell themselves on their merits. I assume this is just a total editorial misfire, although Booster Gold does a better job than the others of presenting its merits within its own Blackest Night tie-in. Then again, I already read Booster Gold regularly. 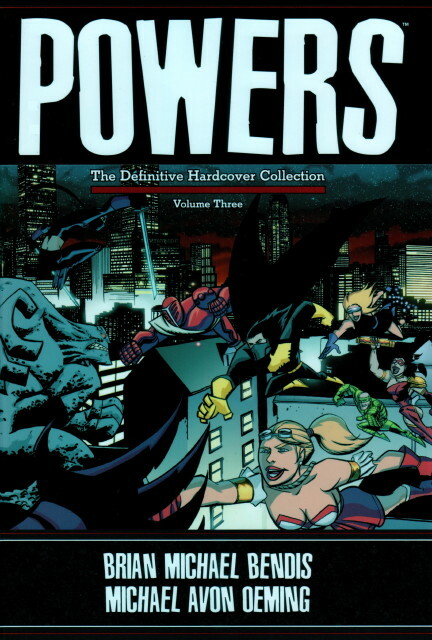 The third hardcover collection of Powers is out this week, and in my opinion it contains the two best stories of this excellent series: “The Sellouts” focuses on a Justice League-like team which went commercial, and then (unofficially) broke up. When the Batman-like member is killed (on camera, his killer not appearing on the tape), detectives Walker and Pilgrim investigate, and air all the dirty laundry the team’s kept under wraps for years. Rather to the displeasure of some members of the team. For what starts as a rather routine detective story for this series, it takes a sharp turn at the end which makes it both a very different story, and one which fundamentally changes the nature of the Powers world (setting up the next series, to some extent). “Forever” is the other arc in the volume, and it was in a way an epilogue to the first Powers series, but it’s also a crucial piece in the overall story: It fills out the background of Detective Christian Walker, who it turns out is more than merely a de-powered superhero who became a cop. But there hadn’t been much sign of this until this story. In other circumstances, that might sound unsatisfying, but Bendis uses the premise to craft an a story which both defines the nature of superheroes in the Powers universe, and to make Walker a more significant and more tragic figure than he’d been before. While Powers is best read from the beginning, you can read this volume on its own if you’d like to try it by starting with the very best the series has to offer. In any event, with the third Powers series having started a few weeks ago, this is a good point to catch up on what’s happened before so you can fully enjoy the new one. You quietly follow their blog and/or Twitter feed (also known as lurking). You comment on their blog or respond to their tweets. You exchange e-mail with them. You friend them on Facebook. You add them to your instant messaging buddy list. You read their posts on USENET. You send them e-mail about their posts. You publicly respond to their posts. You chat with them using talk, BITnet Relay, or perhaps IRC. You talk with them on the phone or meet them in person. Thank goodness today we have enough social networking technology to avoid that last step! Hooray for progress, eh?